Warm and sunny, and a good start to the week! We were a bit late arriving at the yard, due to our 1‑hour scooter rides from northern Phuket, where we'd had another wonderful weekend. Baw and the men (minus Pla who was mysteriously absent today) were busy on the final preparation for the gelcoat spray on port deck. If we ever wondered about the ratio of preparation time (cleaning, sanding and masking) to actual "painting" (gelcoating) time, it seems to be like this: 5 men working 2 days (70 man‑hours) preparing and 3 men working 1.5 hours to spray, or a ratio of about 15:1 in man‑hours. Lots more plastic cling wrap was taped up (we should have bought bulk duct tape for this project). Vinyl and thin plywood stepping boards were taped to the nonskid. Tons of blue tape used all over. If the weather holds, Baw expects to spray tomorrow morning. Yay! 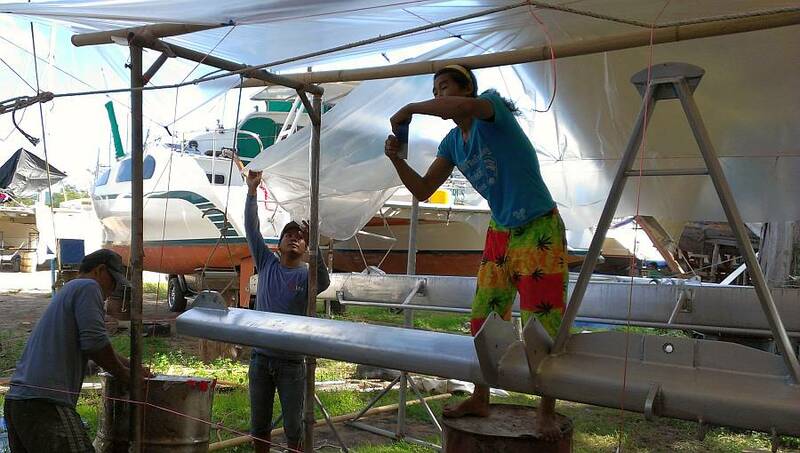 Jon probably got the most noticeable work done, playing in his "rudder workshop" under a neighboring catamaran. In the morning, he and Baw got a bit more filler on the rudder they've been working on. This side still needs some sanding, of course, but it shouldn't need any more filler. But the big gain came in the late afternoon, in that he got the whole second rudder just about caught up with the first one. Nothing like a little experience and confidence to speed things along. He used a wire‑wheel to clean and scuff up the steel surface. 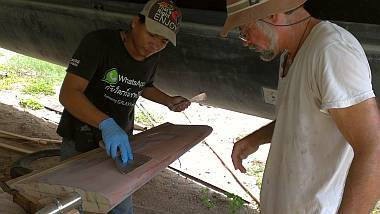 Sue and Baw cut new (larger) fiberglass pieces to be epoxied on. At 3:30 Jon mixed up some epoxy, smeared it on (we'd forgotten a brush) and Heru and Baw helped him sand the steel through the wet epoxy to form a good bond. When the first side was finished they flipped the rudder over and epoxied the other side, then let the rudder hang vertically. A bit of filler was smeared into some of the larger depressions before they covered the blade in 2 layers of fiberglass cloth. 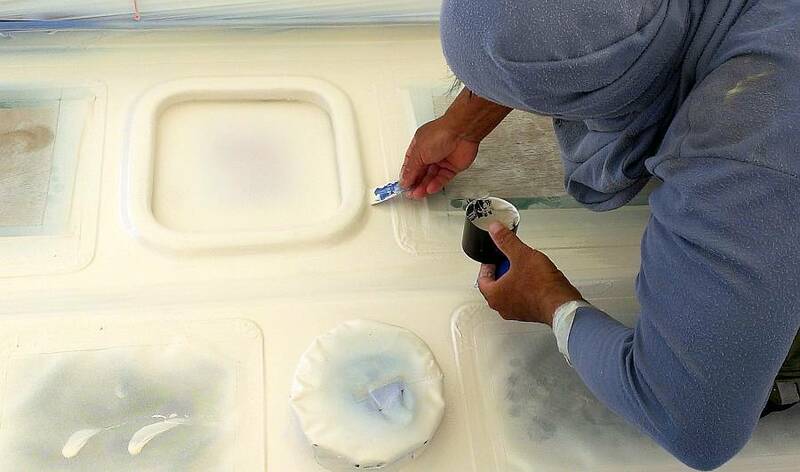 Jon originally wondered if this fiberglass under‑layer was really necessary, but it turned out to be extremely useful when sanding the filler, to tell him when he'd sanded through all the filler and was about to go through to the steel (which he doesn't want to do). But our earlier experience meant that the fiberglass on the second rudder went on much better than on the first rudder. Working wet‑on‑wet, they then paddled on lots of a phenolic and microlite filler mixture and Baw did his magic to form the rough shape of the rudder. The 3 of them worked pretty hard (but pretty efficiently, with Jon doing all of the mixing) so the epoxy work only took them an hour. This will cure overnight, and tomorrow Jon should be able to sand it into a smooth surface. Any low spots will get filled with a bit more epoxy and filler, and then both rudders will be ready for their final fiberglass wraps. Houa got some good projects done. 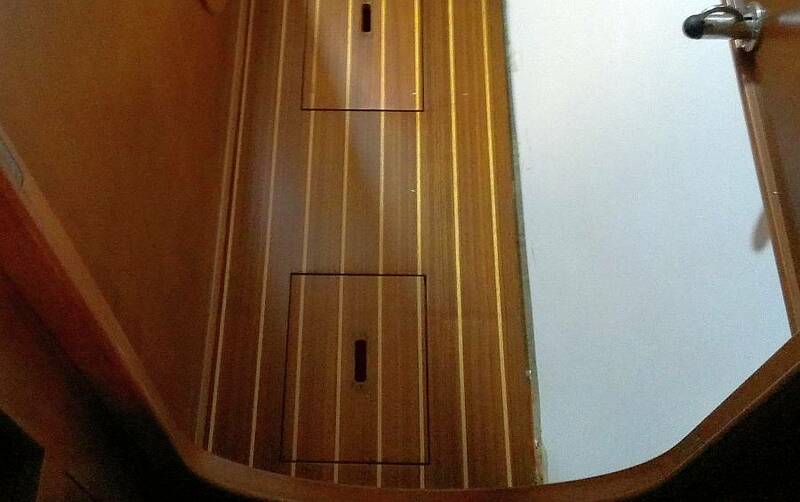 He got the new plywood and veneer step fronts for the forward cabins glued and clamped in place. Then he shaved down and fitted the teak and holly floorboards. The one on starboard was repaired long ago and still looks OK (although it needs varnish), but he found that the veneer on the port floorboard was delaminated, probably from water damage. Houa wanted to repair it, but Jon complained that "We want to get back in the water!" Jon asked Houa for a time estimate to repair, and Houa said "Two days. Guarantee." So we gave Houa 2 days, and it galvanized him into action. In an hour the damaged veneer (and much of the delaminating plywood) was cut off, and the new teak boards (not veneer) were cut and glued on. Tomorrow he'll cut slots and glue in the ash (in place of holly) and sand everything smooth. Fun to see him working so diligently again. Another good day on the Good Ship Ocelot. When we arrived at the yard at 8:30 the men were already pulling out the gelcoat supplies and doing a final acetone wipe‑down on the port deck. More things were needed, though, like socks (which the men wear so they don't stick too badly to the sticky gelcoat overspray) and new filters for their breath masks. So Sue borrowed Chambron's very new, bright cranberry‑colored scooter and ran off to do the errands. Half an hour later Jon, Baw and Lek were mixing the mono‑styrene and mono‑wax in appropriate percentages to the gelcoat, and it was filtered through a clean white sock. Port deck has over 6 square meters of area to be sprayed, and we wanted to get more than 7 kilos of gelcoat on. So Baw figured he would use 7 pots (of 1/3 kilo each) for each of the 2 square meter sections that he and Jon agreed on. The spray tent was long and narrow, so only Baw and Pla (holding the air hose) were inside. Lek, who poured the new pots and added the catalyst, sat in the cockpit behind a plastic "window". Sue was in the cockpit as well, happily far from the smell of polyester. The spray began at 9:50 and went until noon. The temperature was a killer, rising from 94‑100°F (34‑38°C) in those 2 hours. The humidity, though, was near 50%. Baw had to break to change socks between each 2 square meter section, and the gun got a quick acetone rinse then, and a real 6‑minute cleaning between the second and third sections. Today we got to see Pla in action after the spray. He took his little cup of gelcoat, with catalyst, and a small flat plastic paddle and entered the tent. He went from bow to stern finding the indents and voids and little places needing repairs, and dabbed gelcoat on. Doing this while the gelcoat is still wet lets the blobs adhere without having to sand everything first. It leaves little high bumps, but those get sanded off with the first big sanding. Much easier to do these repairs now than after everything has cured. Jon worked on the rudders most of the day, sanding and smoothing and shaping. We had to bite the bullet and buy more Microlight Filler, as we just don't have enough to build the rudders up to where they need to be. Jon was going to paddle more filler onto the rudders but Baw had an appointment and went home after the spray, so he wasn't there to give Jon a hand. More importantly, Baw had the 2 paddles with him. 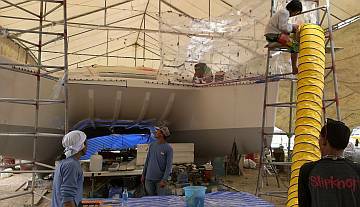 In the afternoon the men hit the (now dry) port deck and removed the vinyl from the nonskid, and pulled down the plastic tent. What took several man‑days to put up came down in about half an hour. Then they began the picky job of cutting away the over‑sprayed gelcoat on the places where it piled up on the edges of the nonskid. It is so much easier to cut it away today, while it's still soft, than it will be tomorrow. Spraying in the morning facilitates this. Once they finished trimming the newly sprayed gelcoat, several of them moved on to the port sugar‑scoop, cleaning and sanding it in preparation to spray it later in the week. They're on a roll! Lek worked under Ocelot sanding the floor grates (again) getting them ready for a polyurethane spray. Maybe tomorrow? Then he tackled the shelves which will be in line for a satin varnish spray. Doing all this varnish work with a final spray coat makes things really smooth and beautiful, but given that Baw is our one‑man spray team, it puts a big burden on him, and of course means we have to get things lined up for him. Houa almost finished the floor board repair. 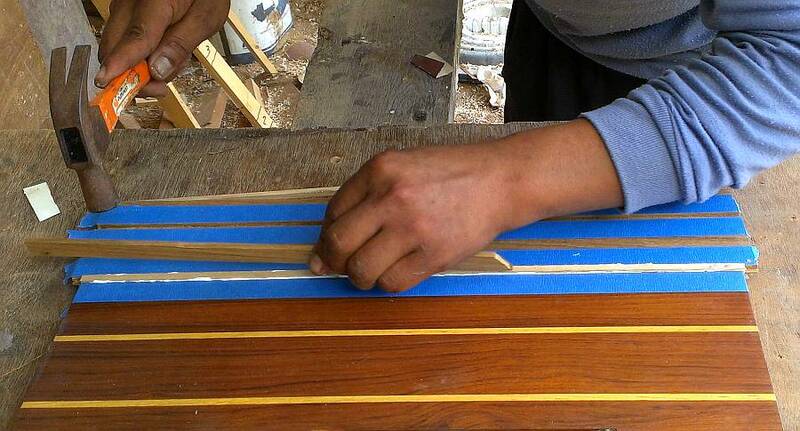 He used the router to cut the grooves for the 4 new "holly" (actually ash) strips that accent the teak strips. After cleaning the slots he used wood glue to set the strips in. Once the glue set (pretty quickly) he hand‑planed the ash strips level with the teak, then sanded both new ends of the floor board. Once we figure out what coating is on the floor board (epoxy or varnish or polyurethane or a combination) we'll have Baw or Lek make the new teak and ash sections match the old. Sue spent several hours removing Nyalic from the mast, going through a dozen nitrile gloves and 2 dozen rags. But the Xylene is holding out, and we should have enough to strip all the spars chemically. Then we'll be sanding them anyway as part of the paint job. A busy, but not earth‑shattering Wednesday at the boat yard, with the temperatures in the high 90'sF (high 30'sC). Today's goal was to get ready for tomorrow's gelcoat spray of the port sugar‑scoop, and we made it. Baw, Pla and the 3 Indonesians all sanded and wiped and cleaned and checked the steps from the engine hatch down to the swim platform. They also moved a table around to the stern of the sugar‑scoop and created a plastic spray‑tent that included the table. This way Baw can spray from the top steps down, and onto the table as an escape. When he sprayed the starboard sugar‑scoop he worked from the bottom up, and it was really difficult for him. We have no problem with the switch‑a‑roo. Anything to keep the gelcoater happy! 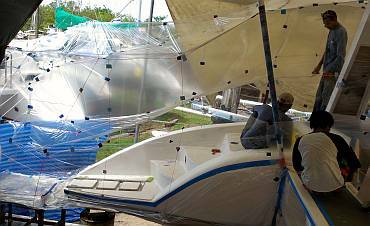 Started work on painting the spars - and a new spray tent! Houa worked for us half a day, as he wanted to finish an outside drawers project for another yachtie, which was OK with us, but not to be done often. In the morning he was true to his word to finish the repair of the teak and holly floor that goes near the water‑maker in the forward port cabin. He got the delaminating plywood frame off the bottom and replaced it with a solid Thai hardwood called takientong. This wood is cheaper than teak, but also very water resistant and durable. After Houa's carpentry work, he gave the floor to Lek who sanded it and put on a layer of epoxy to seal the wood and the base. Next step will be to sand the cured epoxy and spray on several layers of clear polyurethane. 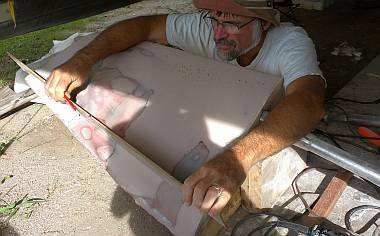 Jon sanded the filler on the rudders some more, then Sue wiped them clean and used a straight‑edge to find the low spots and mark them. In the afternoon Baw and Jon played with epoxy and Microlight and phenolic filler once again, paddling the mixture into the low places. With luck this will be the last filler application on this side of the rudders. Then we can flip the rudders over and shape the other side. Another Landmark Day on Ocelot. And hotter than hot in the boatyard. Isn't it Fall somewhere in the northern hemisphere? We're IN the northern hemisphere! Baw was hot to trot this morning, with all the gelcoat supplies brought out the minute we arrived at the yard. 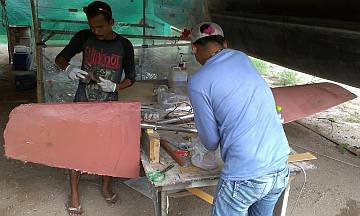 While Heru, Lek and Baw weighed, mixed, calculated, and filtered the gelcoat and its components, the other 3 men were inside the spray‑tent doing last minute sanding and acetone wiping. We calculated the port sugar‑scoop had 6 square meters of area to cover, but since it had lots of bare fiberglass (no undercoat of Ocelot White gelcoat like starboard had) we decided to shoot 7kg. Baw marked off the 3 2‑meter sections, working from the top down. The spray went well, with a full 10 minute stop for gun cleaning at the 2/3rds mark. Both Baw and Pla looked really, really beat after an hour and a half in that tent. The sun was on it part of the morning, and the temperature must have been soaring in there, even with both fans running. Baw came out of the tent feisty and exhausted. All he wanted to do was go home. Which he did, as he had another medical appointment. Unfortunately we had another episode of strange teasing, and the men doing nothing for 20 minutes until lunchtime (with the exception of Pla, who re‑entered the tent and did the necessary "dit‑dot" repairs to the new gelcoat). In retrospect, we think Baw was literally "drunk" on the polyester fumes which must still affect him, even with the filter mask. It must have been murder in that tent. 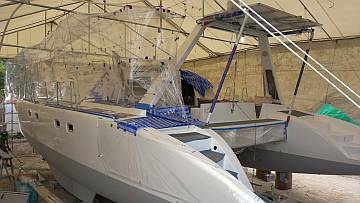 We really want to get the bimini and the louvers and last hatch covers gelcoated, but the varnish project is in the way. So we decided that tomorrow Baw will spray satin varnish on the last interior pieces of teak, and maybe also spray polyurethane on the slatted floor boards, which have now received several layers of epoxy. 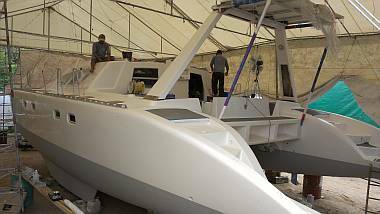 This will free the bimini and make room for the re‑arrangement of everything under the boat so we can get the gelcoating finished ASAP. Baw's first idea of jobs for the guys to do in the afternoon was to start the 400 grit sanding of the new gelcoat on deck. 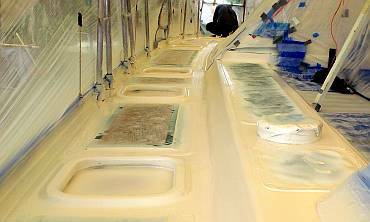 But then he remembered that he wants the topsides polished first so that the water and gelcoat running down the boat will be easy to wipe off. So Pla, Yando and Chambron set up scaffolding on the starboard side of Ocelot, and we had a feeling of "returning to the future." It was 6 months ago that the topsides were gelcoated and sanded to 1500 grit, which is just short of a polishing grit. Today the men got the entire side washed with water and detergent, and the bit of over‑sprayed area on the top, by the toe rail, was sanded with 800 grit. Tomorrow the whole thing will get 2000 grit, and then the magic polishing wheel. We thought Baw knew what polish he wants to use, but today he asked for a 3M product we haven't used before, so we're not sure what's going on there. Hopefully he'll feel more like himself in the morning and we'll be able to sort out the polishing. Jon spent the day communing with his rudders. Again. Today he declared that one side of the first rudder is good enough, so he flipped it over and sanded the new side until it was smooth. Then he used a straight‑edge to mark out where it still needs to be built up. 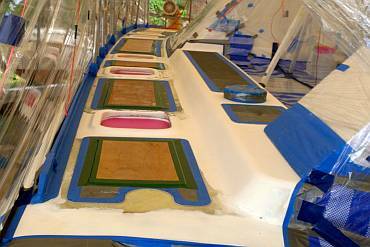 The second rudder also got sanded but some of the epoxy filler we put on yesterday sagged, so the shape wasn't correct. It also got sanded and then marked for where it needs more filler. In the afternoon, Heru came over to help with the filler work. Heru is very amiable, speaks some of the best English of our team, and is eager to learn. He actually seems to understand some concepts that Baw and Houa (our other English speakers) don't, but like most of the locals, Heru's a bit shy and doesn't volunteer much English. Heru's epoxy techniques aren't quite as good as Baw's, but he's cheerful and fun to work with. Once this filler gets sanded down, we're hoping that we'll only have one more side to work on before we glass the rudders up. Sue was the gelcoat "pots and time" recorder again, getting to sit in the shade behind Ocelot, away from the gelcoat fumes. She made sure that Baw knew which pot he was on so he knew how much more gelcoat was going on the current 2 square meter area. After lunch she ran errands for Jon and his epoxy project, and hunted down the polish Baw was talking about using. 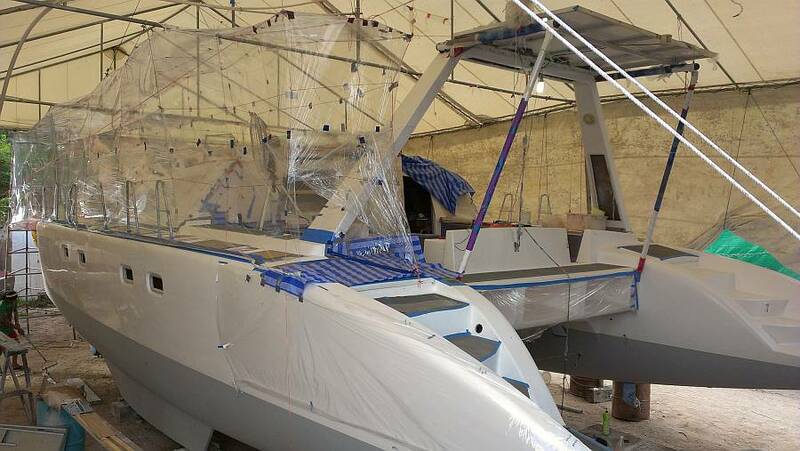 Seems to be a harsh grit sanding polish, so maybe not what we want, as the hulls have already gotten a shine from 1500 and some 2000 grit sandpaper. 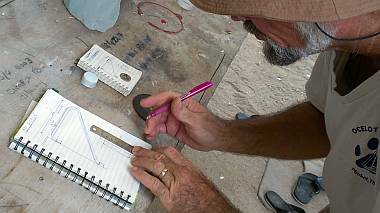 Sue also started organizing her notes on the possible paint systems for the aluminum mast and spars. It's really quite complicated, and we've never gotten the same answer twice from any of the "experts" we've spoken with. We still have some irons in the fire, as it were, so nothing is decided yet. But we want to be able to move on this mast project just as soon as Baw is free from the varnishing and gelcoating. Houa got a bit "fumed out" trying to work inside Ocelot in the morning, so it's too bad we didn't have another off‑boat project ready for him. 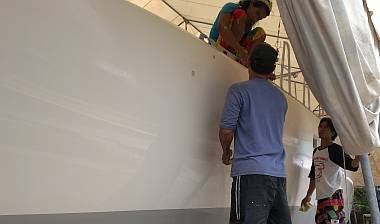 But after lunch, while the guys were taking down the spray tent and attending to the new gelcoat overspray, Houa was able to enter the boat. He began the floor boards border project by making a template of the gap between the bulkhead with new Formica on it, and the floor boards. This is where we had taken out a rubber covering and about 3/8" (10mm) of plywood. He had to uncover the floorboards (we had them covered in protective vinyl for the interior varnish work) and it was fun to see the floor again after so long. One of those strangely scattered days, where lots seemed to be happening, in a lot of arenas. Jon worked most of the day on the rudders, making reasonable progress. The first rudder is now completely faired and ready for the outer fiberglass skins. We'll probably give the rudders 3 skins of biaxial, 1 sacrificial layer of 200, and some peel‑ply for a nice smooth finish (if we can get any). The second rudder now has one side faired and the other awaiting filler, which we hope to put on tomorrow. Houa removed the one floor border piece that was made years ago when we put Formica on the bulkhead in the starboard aft cabin. It was not well designed, so he improved the shape, and also decided that the floor boards bordering these new borders should be square cut, not beveled. All the floor boards with sharply beveled edges are showing signs of delamination on the corners as the floorboards themselves are just unsealed plywood. If he cuts the floors straight, then he can make the new borders by the Formica to fit that new shape more easily. The floorboards will be cut square and their edges epoxied so they'll be waterproof and shouldn't delaminate in the future. In the long run, a good change, and a reduction in the risk of more teak and holly needing to be replaced. Sue was on the scooter much of the day, the main errand being to the big TOA professional paint store near Phuket town. We're still researching aluminum primers, and had heard that both Jotun and TOA have some sort of etch primer. Turns out the TOA primer is more of a thick Rustoleum‑type product, so not what we're looking for. Sue did find (surprisingly) a Sherwin Williams product called "Wash Primer Etching" which, at just $10/liter, she bought. 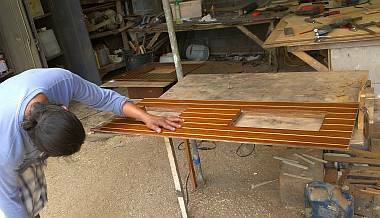 Baw translated the Thai to us back at the yard and we learned that this primer brags about being good on aluminum, steel, fiberglass and wood. NIX. We're not looking for a universal primer, but rather one that brags about its anticorrosive properties on aluminum. Also the Sherwin product wants 2‑3 coats, and we know that etching primers are typically very thin, almost translucent, and if too thick then they were no good. OK. Still looking. In the running now are products by OceanMaster (Etch Primer) and AwlGrip (Max CorCF), plus a product by Altex (Altra‑Bond) from New Zealand which may not be available for import as the transport companies consider it hazardous goods. Baw and Jon scootered off to the same TOA store in mid‑afternoon to buy more polyurethane varnish, and to check out smaller nozzle guns for the mast painting. Baw says his 1.8mm gun is too big for good paint work, and that a 1.3mm gun would be much better. Once again, we offered to buy half and he buys the other half out of his pay (and keeps the gun himself). Of course, this meant that he bought the expensive gun, but we like the idea of Baw trying to build up a business. They got back in time for Baw to get a nice spray of gloss polyurethane on all 6 of the grated floors (which already have 3 coats of epoxy base) and on the new, bare wood wineglass holder that we picked up in the States. These all dried really fast, and will be ready for a light 400 grit sanding, then another coat tomorrow. A bit of Thai silliness for you - when Jon asked for a discount on the spray gun at the paint store, they said they couldn't give a discount, but instead they offered the men 2 bright orange T‑shirts (big enough for Jon!) and, get this, 2 bags of rice! Today was a sort of slow end to the week, after all the earlier excitement of the gelcoat spraying. Rain showers caught us no less than 5 times, with a bit of sun between the clouds. 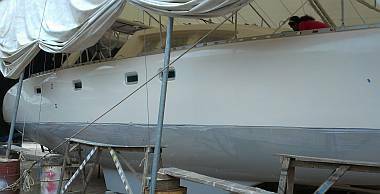 We arrived at the yard to find Baw, Pla and Heru polishing the starboard topsides. They used the polishing wheel and a mixture of 2 polishing compounds, Solar and a 3M product. Strangely, we couldn't communicate the idea of following this up with a marine boat wax, as a protective coating. Maybe Baw thinks new gelcoat doesn't need protecting, but from our point of view, we want that new gelcoat to last as long as it can! Once the polishing was done (Shiny!) 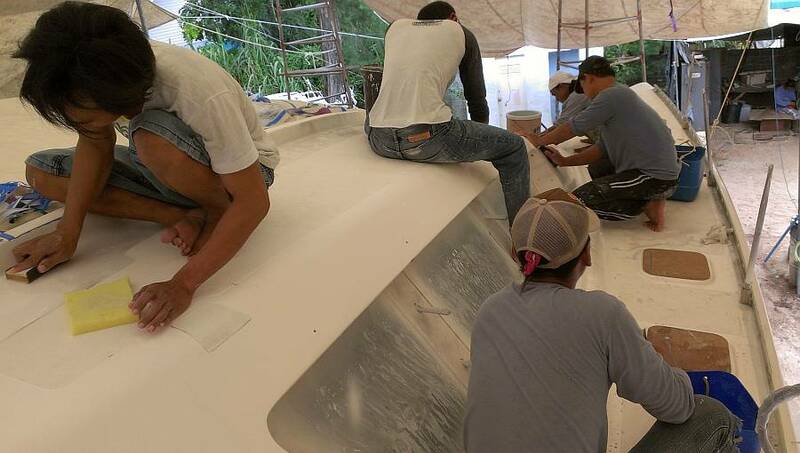 we had 4 men on the white decks of Ocelot for the rest of the day, sanding the gelcoat. When we checked on how they were doing, we often heard, "Very hard gelcoat. Not easy." Well, it is hard, and it's supposed to be. That's what "ISO‑2500" gelcoat is supposed to be - Tough stuff. So yes, a bit more elbow grease needed now, but hopefully we'll have a long‑lasting gelcoat finish. The plan seems to be to work on all the areas around the nonskid with 320 grit, then move up to 400 at which point they will do the small repairs that always become visible. Our biggest concern is that they'll sand off too much, but we haven't figured out how to monitor it. 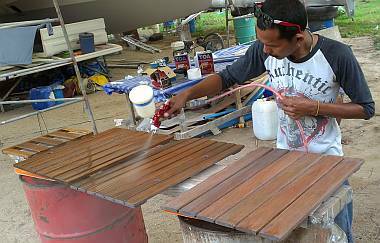 Lek spent his day sanding the grated floor boards that got a coating of polyurethane yesterday. By late afternoon Baw was all set up to spray them all again, but then we got 2 more short but heavy rain showers. Still, the relative humidity never got above 72%, and Baw felt OK doing a spray, so we now have another layer of polyurethane on the floor boards. 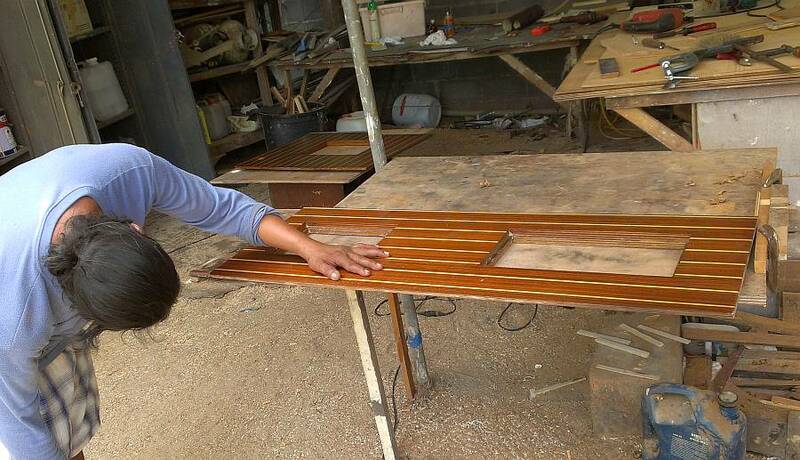 Houa worked on the teak and holly cabin floor boards, changing the old plywood frames that support the floor access panels. All of these are delaminating. We're disappointed they make these out of such poor quality plywood, but it'll be nice to have them made out of solid wood now. Houa will probably use the hard wood takientong, the little brother to teak. Houa begged off an hour in the middle of the day to finish a drawer project for another cruiser, and promised to work an extra hour for us after 5pm. Getting that other project out of the way will give him a bit more money and help him concentrate on our work. There is so much still to do and we didn't count on the need to re‑build the frames under the cabin floors. Silly us. 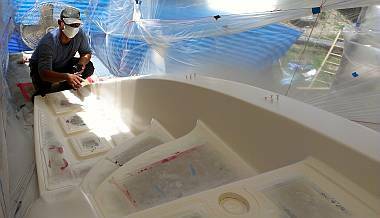 Jon wanted to put more epoxy on the rudders but he didn't want to do it in such humid conditions. Instead, he cleaned the one remaining rudder and then mapped out where it needs more filler. It will need more cleaning just before the filler goes on, but that happens pretty quickly. Jon also made a drawing for the support bracket for our cockpit table. The cockpit table is usually folded in half, and when we want to use the full table we fold out 2 triangular stainless steel supports first, and they support the second half of the table. But those supports seem to have grown legs and wandered away, as we can't find them now. A bit frustrating, but those supports were not ideal - the table ended up resting on a steel bar, and that bar gouged the table a bit. Those gouges were removed when Houa replaced much of the teak in the table, but we don't want to gouge the new table. So the new supports will have special pads mounted to the top to spread the load when supporting the table. We'll glue something soft onto the pads so they shouldn't even mar Baw's gorgeous varnish work. Sue did the normal Saturday bank run and payroll sorting. Plus she got in another hour on the Nyalic removal on the mast. We only have the bottom 1/4 still to do, under the lowest spreader. But there are still the spreaders themselves and the new prod. Perversely, it's comforting to see the filiform corrosion on the mast, knowing that it was going to "grow" endlessly under the Nyalic. Now we just have to find the right coating to stop it!